!! Crumpet Top 10 Changer !! We need rapturous applause, and then awed hush. Ladies, I have just become the overwhelmed owner of Lady of the Lake, a polish of such delicacy and beauty that I may not be able to stop talking about it. EVER. 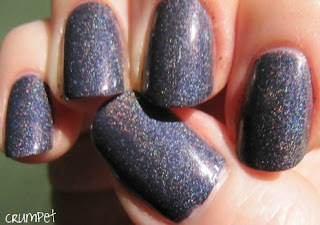 I’ve seen this polish blogged several times. I am here to tell you that whatever you have read does not even *begin* to describe the sheer majesty, perfection and awe of this polish. This is regal, awesome, grand and just damned fine. 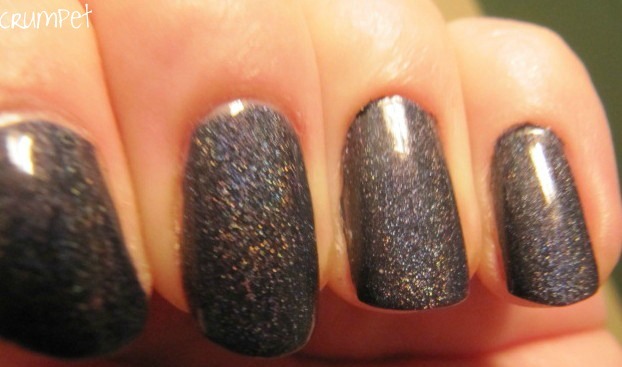 Man, this is the polish of all time. I want to start first with the colour, because my camera (which hates purples) has not been very kind to you. It’s not as blue or as greyed out as the photos make it appear. 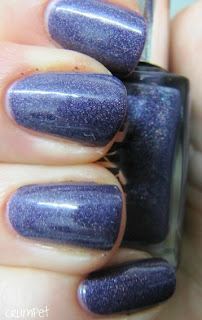 This is a beautiful dusty purple. No brown or red tones, yet somehow not cold either. The purple is deep, and indigo hued – dazzling, without being bright. 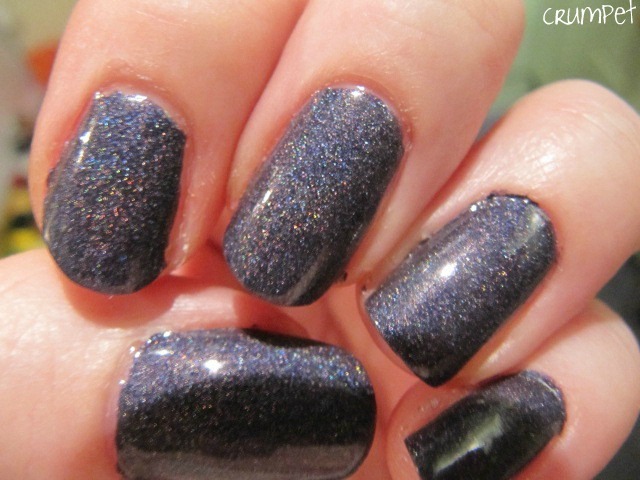 This beautifully serene colour is then mixed with a holographic suspension that is divine. The particles are the smallest I have ever seen, giving this a rainbow shimmer that is just to die for. When I say this polish is “fine”, I mean it in 2 senses: fine as in lovely, and fine as in the exquisite intricacy of the holographic particles. I’ve talked about how the Milanis use a coarser particle – well, this is as fine as you can go and yet still exist. I’ve tried really hard, but I don’t know if any of my photos do this Goddess justice. 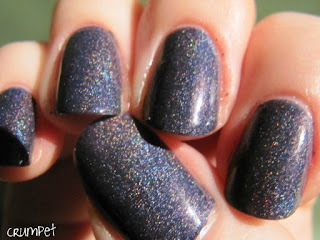 Close up the holo is mesmeric – it is a rainbow dance of the teensiest pixies, a mist of holographic dust, the very finest of micro-organisms. 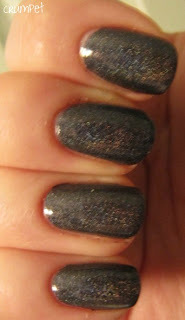 The holo almost seems to float, suspended, between the base coat and my top coat, as if the particles are locked into rainbow bubbles of awesomeness. This is some serious wow. The rainbow in this is just beautiful, and soooo subtle, again due to the fineness of the particles. Predominantly, this glows golden, adding warmth to what would otherwise be a cold-hearted purple. 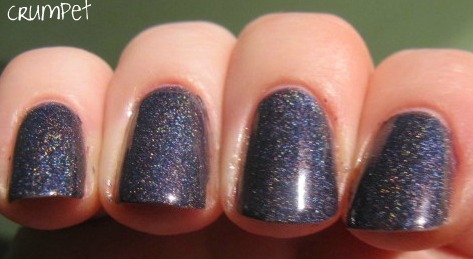 The holo isn’t linear, but sits there, suspended and scattered like a duvet of fairy dust, epic and magical. 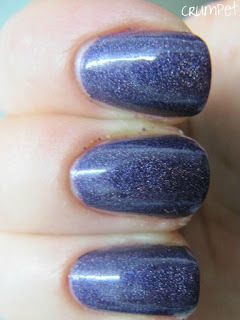 This is BY FAR the best holographic purple of all time. Better than Glitter Gal. 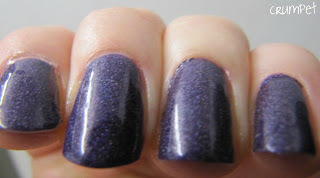 I have an Ozotic purple holo on order, which should arrive within the week. 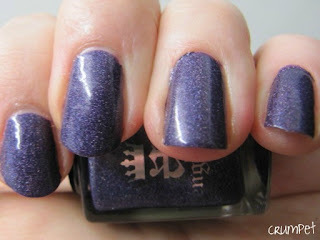 When it does, I’ll do you a comparison post on the 5 purple holos I own (OMG that is such an outrageous statement lol – was 1 not enough for me ?? 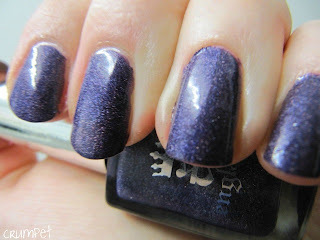 no …..), but this is the winner by a country mile, not just because of her overall beauty, but especially because of how deeply pigmented she is – this IS the dark purple holo to end the search of all dark purple holos. If I get some sunlight, I will update the photos – I’m really not happy that you’re seeing her in enough glory, and she deserves that, because more than anything, glorious is absolutely what she is.